Manufacturer of a wide range of products which include safety rope ladder. 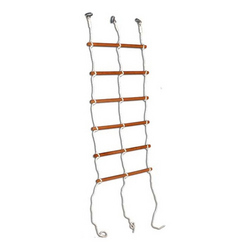 We manufacture premium quality Safety Rope Ladder, that are produced using high quality raw materials like, aluminium, wooden or nylon materials. They are structured in round shapes as loops with hooks at each end. Designed with high precision, these are extremely useful while doing work at great heights. The ladders are available in varied designs and sizes, and can be improvized according to customer's requirements. Looking for Safety Rope Ladder ?